Offering almost an old-world Hollywood glam, the Natalie Velvet Sofa is lush to the touch and loaded with textural appeal. 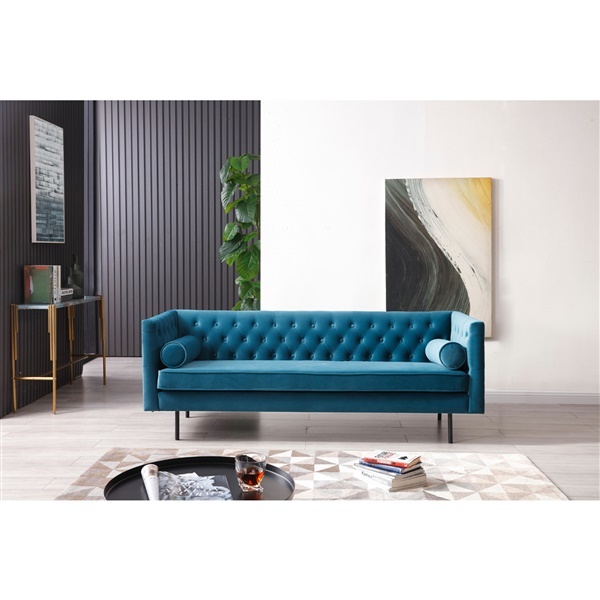 Available in your choice of vibrant velvets, each adorned with bold button-tufting, the Natalie Velvet Sofa also brings classic comfort to the forefront with a lush layer of memory foam. Your choice of ultra soft and rich velvet upholstery colors. Expert tufting details add visual and textural appeal. Generous padding features an added layer of memory foam for optimal comfort. Bench-made by skilled craftsman using durable and strong materials. VELVET IS PURE LUXURY!! I never imagined buying a velvet couch in my life but I am REALLY GLAD I did!! Comfortable, soft - it's like i'm melting into it each time I sit down! Thanks inmod! The features said it but I didn't adhere - although I wish I did, velvet definitely catches light differently and the colors in the photos are slightly different than what I received in person - ASK FOR SWATCHES first! Spectacular in green! Attractive, eye-catching! Everything i wanted and more! Yes to design and yes to velvet!! But a no whrn it comes to not requesting fabric samples!! I don't even know which part of this I love the most. I am beyond thrilled with my new buy! Everything about it is absolutely exceptional. I am a repeat Inmod costumer because I love all of their stuff, but I was really digging the sleek look of this sofa. The velvet is glamorous and the tufting adds an extra touch. Really great looking piece and the price is awesome as well. Very happy with it. ProsVelvet is soft and the color is great. Very glamorous piece. It is so easy to find sofas and furniture in general in neutral colors (which is not my thing) but this sofa comes in the best colors! I ordered it in the Coral Pink color and it fit perfectly with my decor. It added a nice flair of color and goes really well in my room. Super affordable which was the best part!! Is this green darker in person than it is on the site? Are the arms at an awkward height because it's the same size as the back? There are computer monitor variances, so we recommend sending a swatch of the green material for you to see in person. You may email your request to [email protected], including the name of the item, the color you would like to see and your mailing address. The arms on this style of sofa are quite a bit higher than on a standard sofa.